Technicians will load more than 1,000 pounds of food and clothing into SpaceX's Dragon capsule next month for delivery to the International Space Station on the commercial craft's first flight to the outpost. Working inside the company's hangar adjacent to the Falcon 9 launch pad, technicians will carefully stow approximately 530 kilograms, or 1,168 pounds, of station-bound cargo inside the Dragon's pressurized section. Most of the supplies are currently scheduled to be loaded inside Dragon in mid-April. Josh Byerly, a NASA spokesperson, said the cargo is comprised of mostly low-value items such as food, water, and clothing to supplement supplies delivered this week aboard Europe's Automated Transfer Vehicle. "It's not one-of-a-kind [hardware], but it's important cargo, all the same," said Mike Suffredini, NASA's space station program manager. Future Dragon flights will be filled with more than 3,500 pounds of cargo. Widely anticipated by NASA, lawmakers and space enthusiasts, the flight is due to blast off no sooner than April 30 at 1622 GMT (12:22 p.m. EDT) from Cape Canaveral, Fla.
Beginning a two-day high-speed chase of the space station, SpaceX's Falcon 9 rocket will lift the gumdrop-shaped spacecraft into orbit a few minutes after launch. The SpaceX flight will also carry some research payloads, including student experiments and scientific gear for NanoRacks, a company which designs low-cost research platforms for the International Space Station. 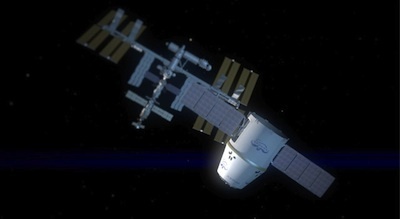 The space station crew will unload cargo from the Dragon spacecraft after its scheduled arrival at the orbiting lab May 3. The astronauts will replace the supplies with 660 kilograms, or 1,455 pounds, of equipment for return to Earth. Besides Russia's Soyuz crew capsule, the Dragon will be the only spacecraft able to return space station hardware and experiments to Earth. After about a three-week stay at the space station, the Dragon will parachute into the Pacific Ocean west of Baja California for recovery by a maritime retrieval team. 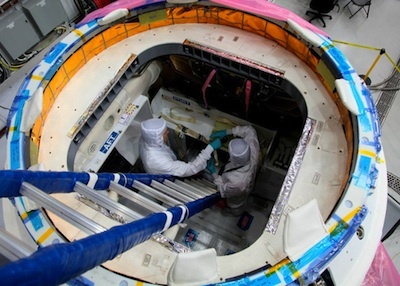 Supplies for the Dragon mission are already arriving at the Kennedy Space Center, where they are being packaged and prepared for flight inside the Space Station Processing Facility, according to George Diller, a NASA spokesperson at KSC. Measuring 9.5 feet tall and 11.8 feet wide at its base, the Dragon's pressurized cabin has a volume of about 245 cubic feet, according to SpaceX. The cargo aboard the Dragon craft's first flight to the space station will not go toward the commitment in SpaceX's $1.6 billion contract to transport 44,000 pounds of supplies to the complex over 12 operational flights. "This was additional cargo that was added so that we could fully check out the cargo capability on the demo mission," Byerly said. SpaceX's operational Commercial Resupply Services missions could begin as soon as August, assuming the upcoming test flight goes well.